A broken man. A twist of fate. A second chance. From the #1 New York Times bestselling author of The Mistletoe Promise and The Walk comes the first novel in a riveting new trilogy that explores the tantalizing question: What if you could start over?Chicago celebrity, Charles James can’t shake the nightmare that wakes him each night. He sees himself walking down a long, broken highway the sides of which are lit in flames. Where is he going? Why is he walking? What is the wailing he hears around him? By day, he wonders why he’s so haunted and unhappy when he has all he ever wanted-fame, fans and fortune and the lavish lifestyle it affords him. Coming from a childhood of poverty and pain, this is what he’s dreamed of. But now, at the pinnacle of his career, he’s started to wonder if he’s wanted the wrong things. His wealth has come legally, but questionably, from the power of his personality, seducing people out of their hard-earned money. When he learns that one of his customers has committed suicide because of financial ruin, Charles is shaken. The cracks in his façade start to break down spurring him to question everything: his choices, his relationships, his future and the type of man he's become. Then a twist of fate changes everything. Charles is granted something very remarkable: a second chance. The question is: What will he do with it? 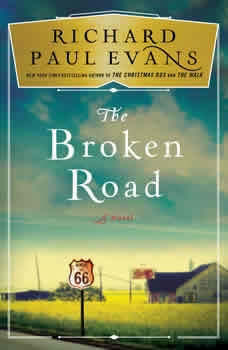 The Broken Road is the first book in a much-anticipated new trilogy by beloved storyteller Richard Paul Evans. It is an engrossing, contemplative story of redemption and grace and the power of second chances. It is an epic journey you won't soon forget.